The background makes this page unreadable for me. It's almost like an optical illusion. Point taken. I should be changing the whole theme soon. Database access can also be done in an event loop. It's simply another socket connection - the web server can process other requests while waiting for a response. Of course this requires a complete redesign of how web apps are currently structured. Rails, Merb, nor Rack are structured in a way that breaks up the request processing into such chunks. 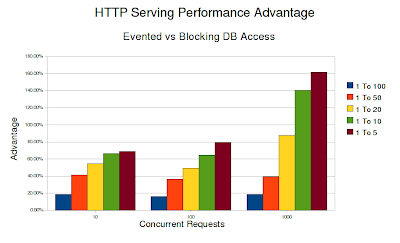 Make all external queries (memcached, database, etc) evented and part of the request loop and you'll see very good performance, i think. @four, The benchmark actually behaves like this. I have modded the PostgreSQL adapter to behave in an evented way (in case it finds itself operating in the context of a special fiber). I managed to use Sequel for the above benchmarks. Making it Merb or Ramaze compatible should be easy, the framework need not know that IO operations are evented, Fibers take care of all the slicing and dicing behind the scenes. What I was suggesting was a single threaded single event loop for every connection. The database file descriptors should be part of the same select/poll group as the http clients. this is possible but you must break request processing into before-db-query and after-db-query functions since nothing may block. In terms of integrating this with existing servers, I know that the ramaze guys have something in the works to make ramaze "fiber friendly" -- I'm not sure if the work has made its way all the way to being committed, but some branch or other works that way, you could ask them. Merb also hopes to be 1.9 compatible as of version 1. Also note that if you need an evented driver you could use a fibered mongrel [either rev's version, or that described in http://209.85.173.104/search?q=cache:EcGf70nMwgwJ:betterlogic.com/roger/%3Fcat%3D35+asymy&hl=en&ct=clnk&cd=3&gl=us&client=firefox-a ] and hook that in with your now fully functional postgres driver and it should work as a full app. Way to go. I can imagine this becoming quite popular among 1.9 apps. Could work nicely. good call on the massive memory savings, too. Those running on VPS's will probably benefit, and perhaps it will be stronger overall. I think the good news might be that, though fibered DB is slower synchronous for short queries, it is only slower for them when there is low load [in a high load you'd expect them to be interspersed with some long queries, thus the advantage of asynch winning out]. Since they are only faster in low load, that means that there are more resources available to process them. And since there isn't a high load, it'll probably finish quickly, anyway. I.e. the slowness is during a time of non contention, so the slowness doesn't hurt, because overall it'll run fast. Good luck with all that. Four's thought is interesting, too. With EventMachine you're stuck with one event loop. However with rev each thread can have its own event loop, if desired. I'm not sure if running multi-threaded + fibered would help or hurt things. found that "multi threaded and multi process" was a good combo. Don't know if that means the same as "multi fibered and multi threaded" though. @mormon, I just ran a very simple query ('select id from users limit 1') and compared both approaches. The blocking mode is faster before I reach a count of 100 and after I reach a count of 2000 short queries. Adding a single long query ('select sleep(1)') pushed the limit to 6000 queries before blocking mode started to gain back. I am not so enthusiastic about threads though. If all IO is nonblocking, why would we need another context switching overhead? Interesting that blocking mode would be faster after 2000. I wonder why that would be. I guess you could almost make the assertion that "asynch IO is, in general, slightly slower for fast queries"
With regard to RAM usage, perhaps since you'd be cutting down on Thin processes, you could do without the COW aspect of REE, but keep the [newer, faster memory allocator], which could speed up your app about 10% . So you win twice. I wonder if blocking mode is faster with > 2000 queries because it still runs fewer simultaneous queries at the same time [blocking for each one] or what not. I guess. Seeing as it seems faster for very fast queries to block, one option would be to 'guess' if a query is going to be extremely fast or not--if it is then just revert back to the old blocking way. The benefit of this being that while you are retrieving your fast query the other long queries which are 'fiber blocked' are still running in the background. I wonder if there's some play in the size of the fiber pool, should those things be the case [to allow one to not slam the mysql server with too many requests]. Guess what? I was just working on this feature (allowing queries that you know are very fast to run in blocking mode). I came up with a nice interface to wrap those blocking queries which I should be releasing soon, among other things. As for overwhelming the db, the db connection pool should be decoupled from the fiber pool, it should also handle the "too many connections" error gracefully. I guess with the new library you'll be able to know better the impact of fibers [versus whatever else is in there].